The babywearing jacket Wallaby 2.0 adapts to you in every moment; from the early stages of pregnancy to the first years of your baby's life. Wallaby 2.0 is more than a pregnancy and babywearing jacket. With its trendy and functional design, you can also use it as a normal jacket for as long as you want. 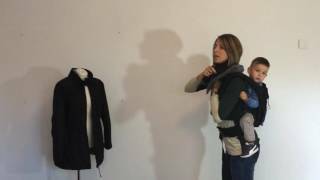 Wallaby is a babywearing jacket that adapts to your body, so you will be able to use it during pregnancy and afterwards. Wallaby has a detachable baby carrier extension with man made sheepskin lining with elastic drawstrings to adjust desired size on top and bottom that you will be able to use in the late stages of your pregnancy and to carry your baby, on the front and at your back. With an adjustable waistband for a slim fit, Wallaby adapts to your outline, so you will have a feminine coat that will enhance your figure. Wallaby is compatible with all ergonomical slings. The babywearing jacket Wallaby has a detachable over collar in man made sheepskin to protect your neck and keep your baby head warm, so you won't need a scarf or shawl to avoid the cold and your baby will be secure without tassels or frayed edges on her way. The collar can also be positioned to protect you from the cold when you carry your baby on your back. The different detachable pieces of your jacket are easily mounted and dismounted. With its detachable hood with man made sheepskin lining secured by snap fasteners, Wallaby can be adapted to match your style.